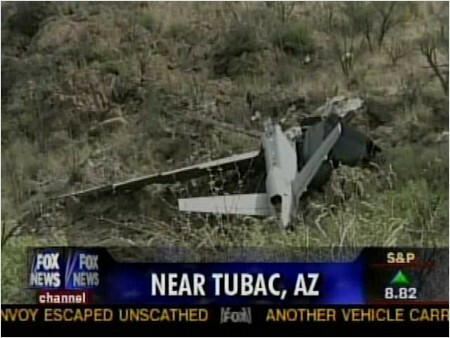 I missed this until now, but a U.S. Border Patrol's Predator UAV crashed in Arizona last month. The crash didn't make civilian pilots too happy. The Aircraft Owners and Pilots Association wasn't too happy about the UAVs before they crashed, either, since the FAA had imposed flight restrictions on a 350 mile section of Arizona and New Mexico because of the Predators' operations. And in general the AOPA worries about the danger UAVs pose to other aircraft. The pilot reported that during the flight the console at PPO-1 "locked up", prompting him to switch control of the UAV to PPO-2. Checklist procedures state that prior to switching operational control between the two consoles, the pilot must match the control positions on the new console to those on the console, which had been controlling the UAV. The pilot stated in an interview that he failed to do this. The result was that the stop/feather control in PPO-2 was in the fuel cutoff position when the switch over from PPO-1 to PPO-2 occurred. As a result, the fuel was cut off to the UAV when control was transferred to PPO-2. The U.S. Border Patrol isn't the only group flying UAVs in the area. A vigilante group called the American Border Patrol, in conjunction with the Minutemen, has been flying their own homebuilt UAV—apparently a souped up model airplane. They even have video of their vehicle in action. And then there is the anti-vigilante group UAV flown near the border by Chris Csikszentmihalyi. Quite the crowded airspace down there these days.